The girls are off at their grandparents’ this week, giving me time to work on some top secret projects (more details soon!). I wanted to have a little something to surprise them with when they return home, though, so I whipped up one of my favorite 20 minute projects: a girls’ elastic waist skirt. This one is for our three-year-old, and takes just 1/2 yard of fabric and truly only 20 minutes. I went with one of Heather Ross’ Far, Far Away prints, snails in blue and orange. The weather is still hot, and the double gauze of this print is the perfect weight to get us through the last days of sweaty as we look forward to fall! For more double gauze prints, check the Whipstitch Shop. Happy stitching! I love simple projects like these! Turned out cute. I love this skirt! I have been looking for something simple to make for my daughter. I'm not a confident sewer, so this seems right up my alley. 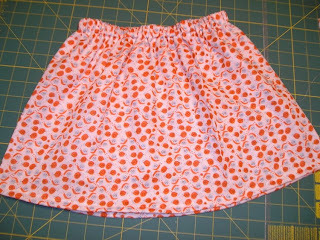 Do you have a pattern or instructions for this skirt? ?